The smell of hot rubber isn’t all that uncommon after driving some BMW quicks. Being hugely entertaining to drive, the 4-Series has loads of performance on offer and even comes in a convertible. What we have here today, however, is the latest BMW 4-Series offering – the flagship 4-Series – if you will: BMW’s new 4 Series Gran Coupe petrol models. Essentially it’s a four-door Coupe with nice athletic lines and plenty of flair. 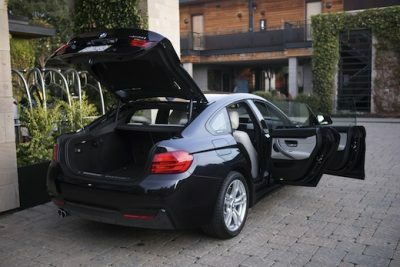 Having the extra two doors does make this the most practical 4-Series to date, and it’s easy to slip in-and-out of the rear seats with the wide opening door. Just watch your head on the sharply angled roofline over the rear doors. Once inside, the rear seats are very comfortable, leather upholstered and reclining for added comfort. You can seat three across the back seats, however life is good when there is just the two of you because you can pop the centre arm rest down between you both and park your drink in the cup holders and plug in your electronic device. Life in the middle seat, if you’re an adult, is otherwise tight, mainly due to the drivetrain tunnel protruding into your leg space. Interestingly, the tailgate is a hatchback type, so you have plenty of room to put your luggage inside the Gran Coupe’s boot space. Split folding rear seats mean that if no one is sitting in the rear seats, they can be folded flat to accommodate lengthy cargo or even just a whole lot more cargo. This is an awesome car for the long weekend, I might add! For 2018 the BMW 4 Series models have some updated headlights, rear tail lights, new exterior colours and a few subtle changes to the beautifully put together interior. Inside the new Gran Coupe, the driver is cosseted in a lovely cushioned and supportive sports/luxury seats. Premium models offer electronic adjustment and cooled or heated to your tastes. Across the dash there is more chrome and more black panelling to give the car an even more upmarket feel. Centred at the top of the dash is a nice clear touch-infotainment screen with loads of cool apps/features that you can control via touch or with the round dial on the centre console – in the way that many BMWs have done so before. This is an easy way of scrolling through and selecting the feature you want to adjust or turn on or off. The instrument dials behind the steering wheel are now electronic which looks really modern and classy when in action. At night the switchgear lights up nicely across the dash looking elegant rather than extroverted – just the way you would expect a quality European to look. In the new BMW 4 Series Gran Coupes you get a nice set of 19-inch alloy wheels, premium leather seats, BMW Connected Drive, satellite navigation, awesome LED headlights, LED tail lights, front and rear parking sensors and of course the ultimate driving experience. M Sport models brim with dynamism so you get the bigger engine, sporty exterior detailing, a stiffer suspension and powered front seats. Luxury Edition 420i models get a glass powered sunroof, metallic paintwork, comfort access to the cabin and boot space, as well as heated front seats. 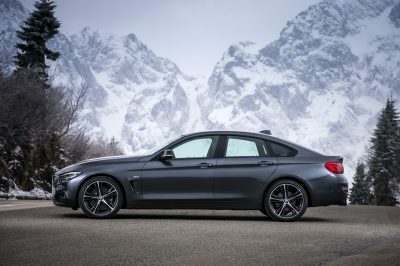 A new BMW 4 Series Gran Coupe M Sport does offer a lot of brawny power but even with this sportiness comes the practical four door styling and a hatchback boot space that is exactly the same volume as the 3-Series Sedan. The split-folding rear seats fold right down to provide a massive cargo space should the need arise. Throughout the cabin there are plenty of handy storage compartments to make the car useful for a small family. There is no need to be apprehensive about pushing the 4-Series Gran Coupe to its limits; the car has awesome control, and the grip levels are superb. Not only does the car have outstanding acceleration but the 4 Series Gran Coupe can stop very quickly as well, thanks to the clever braking technology on-board. An xDrive AWD option is available which is linked to the 8-speed automatic sports gearbox. At present, BMW Australia is offering just the three petrol models, but we’ll keep you posted on developments like diesel models and hybrid options. The petrol models kick off with the 420i Luxury which boasts the BMW TwinPower Turbo inline 4-cylinder petrol engine with 135 kW and 270 Nm. Thanks to the close ratio gearbox with paddle shifters and modern turbine technology, the 420i can still scamper through the 0-100 km/h dash in a smidgeon beneath eight seconds. Expect fuel economy to be good, because it is, and you’ll be able to average around 6 litres/100 km with a light right foot. Next comes the 430i Gran Coupe which offers a tweaked version of the same engine found in the 420i. However, power jumps to 185 kW, torque rises to 350 Nm and the 0-100 time lowers to around six seconds. It’s the BMW 440i Gran Coupe that will really mangle a track. Boasting BMW’s potent TwinPower Turbo inline 6-cylinder 3.0-litre petrol engine with 240 kW and 440 Nm you are in for a quick ride. Surprisingly frugal when loping along the highway at legal limits, this engine will burst into life the instant you plant your foot. From a standstill you will reach naughty speed zone in around five seconds! Having said that, any of the petrol powered 4 Series Gran Coupe models are stealthy performers – just the way they should be! A two-door coupe, a four-seater convertible and a Gran Coupe make up the BMW 4-Series stable. With this sort of choice, you can be sure that you’ll be looking your best when turning up at the party. The 4 Series Gran Coupe is the icing on the cake, having that extra glamour and elegance along with practicality. If you’re like me, then this is the model I’d like to have on a daily basis. 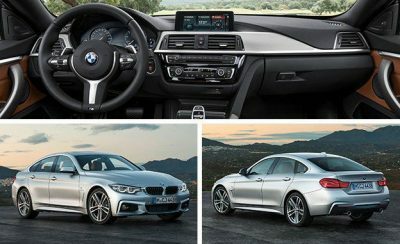 For any more information on the new BMW 4 Series Gran Coupe or, for that matter, any other new car, contact one of our friendly consultants on 1300 303 181. If you’d like some fleet discount pricing (yes even for private buyers! ), we can submit vehicle quote requests out to our national network of BMW dealers and come back with pricing within 24 hours. Private Fleet – car buying made easy!